"You can learn a lot about rhythm and texture by playing these pieces, in addition to the rewards of, well, playing these pieces. The book is handsomely covered and ring-bound; features which never make up for shoddy music, but here the binding only does justice to the contents." 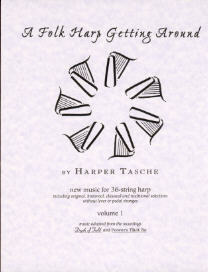 Harper Tasche has published music for you, whether you play a lap harp, a folk harp, a small harp, or a cross-strung harp! 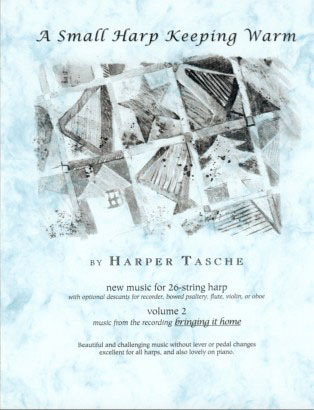 All of Harper's concert-quality compositions and arrangements are beautifully typeset and printed on heavy opaque paper, jacketed with protective vinyl over-covers, and comb-bound to lie flat. The "Lap Harp" series is written for a 19/20-string or larger harp (lowest note is G below middle C). 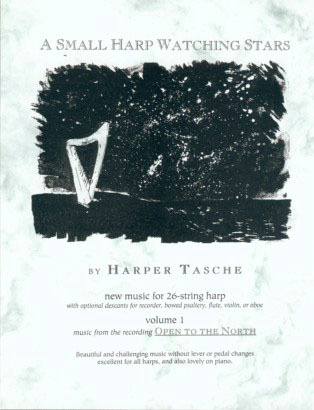 Lively, vivid, and introspective original pieces modeled on traditional Irish, Scottish, Welsh and other styles, for 36-string harp (E-flat tuning and levers required). Selections featured on the CD Further. Titles:The Mermaid's Song, Carolan's Welcome, *John Peel, *The King of Love, Flora de Santa Cruz, *Ellen Magdalena, Another Double Shot, Phase Oasis. The "Folk Harp" series is written for a 36-string harp (lowest note is C two octaves below middle C) and contains occasional lever changes. 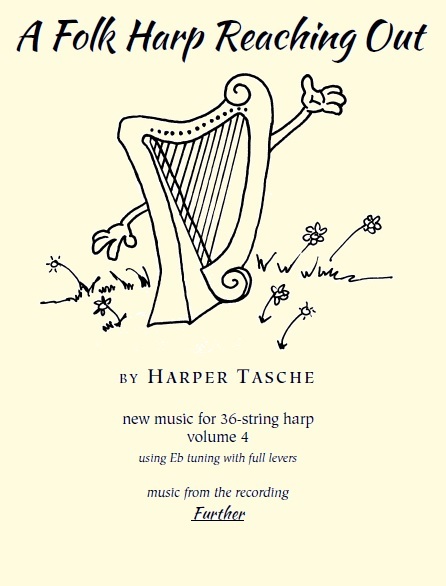 Beautiful, complex, and playful original music for 36-string harp (E-flat tuning and full levers required). Selections featured on the CDs Provenance and The Summoning. Titles:The Seldom Inn, Sunset Habanera, Amble & Chat, Garden for Two, Best Foot Forward, Silly Bear Waltz. 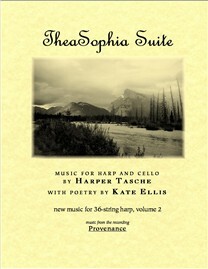 A suite of six original pieces for 36-string (diatonic) harp and cello, interwoven with poetry by Kate Ellis. Interconnectedness, spirituality, health, death, and life are major themes in both the music and the text. Four movements can be performed by solo harp; cello parts are included for four movements. The entire Suite is featured on the CD Provenance. Titles: The soft sighing sound of being, You are all there is, Featherspirit, An island apart, The space between heartbeats, Spirit will always hold us. 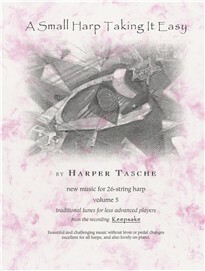 Solos arranged with no lever changes for 36-string harp, from the CDs Powers That Be and Depth of Field. Includes pieces from Franz Schubert and Turlough O'Carolan, medieval Spain, the Scottish Highlands, and new music by Harper Tasche. Titles: Dancing with Franz, Rosa das Rosas, Lady Dillon (in two keys), The Summer Country, October's Rose, The Surge of the Sea. The "Small Harp" series is written for a 26-string or larger harp (lowest note is C below middle C) and requires no lever changes. Titles: John Peel, On Sunday, Zalongo, Paul and His Chickens, The King of Love, The Maid From the Mountains, Solitude Day, Bonnie Portmore. Previously unpublished favorites from the CDs The Summoning, Dichotomy Café, Bringing It Home, and Open to the North. Titles: Dance of Time, Holy Manna, Mazurka Michel, An Giolla Ruadh, Enymin's Journey, Behind the Embers, Unknown Quantity. Four original pieces and a new arrangement of a traditional favorite, with a feature-length article for each. NOTE: This book is now available as individual selections (each with article and music) as downloadable PDF files. To order, click here and specify which titles you would like from the list below. 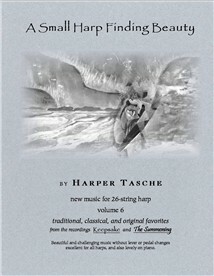 Your order will be confirmed via email, and the PDFs will be emailed to you upon receipt of $3.75 per title either via electronic payment (send direct funds via PayPal to harper@harpcrossing.com) or receipt of your check or money order. Titles: After Askadalen, An Indefinite Road (from Open to the North), Spinning Star (from Bringing It Home), The Ash Grove, and Mark's Farewell to Whidbey, (voice and harp). Rhythmic, classical, traditional and original selections from the CD Bringing It Home. Introspective and lyrical original favorites from the CD Open to the North. Titles: All the Octobers, Ellen Magdalena, Forest Carol, Michael's Crossing, The King Stag, Sahzhatem, Orion's Waltz, Berceuse Lunaire. 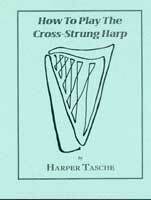 The "Cross-Strung Harp" series of materials is written for various sizes of instruments (see individual titles for specific ranges). 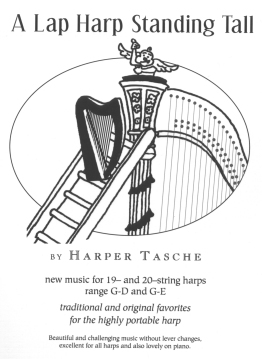 These harps have no levers, but accidentals are included. Titles: Preludio (J. S. Bach), Merch Megan, Tuoll' on mun kultani, The Athole Highlanders, Beach Spring, Pal på haugen, Pala Magla, Elsbetsschottis, Trio (J. S. Bach), Prelude (Frédéric Chopin), Sichelein Rauschen, The Dark Woman of the Mountains, Tryggare kan ingen vara.